Candace Hill set a championship record in winning the IAAF World U20 Championships 100m in a loaded final. Team USA added three gold medals (Candace Hill in the 100m, Sammy Watson 800m, Marcus Krah 110H), three silver medals (Aaliyah Miller 800m, Amere Lattin 110H, Lynna Irby 400m) to the swag haul today. Hill's time of 11.07 is a new championship record and Irby's mark of 51.39 is the seventh-fastest all-time for a U.S. high schooler. 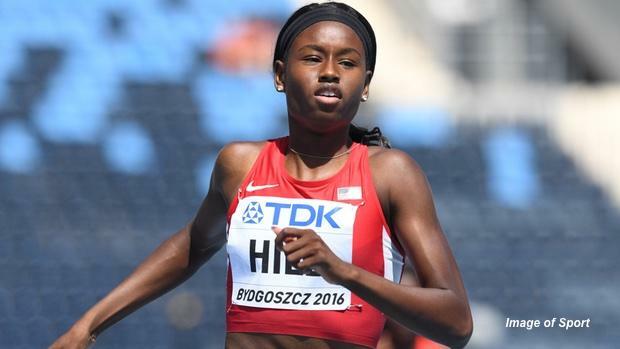 Irby is a rising senior at Pike High School in Indiana -- is there a battle with Sydney McLaughlin in the future? Qualifying rounds saw Anna Cockrell advance with the fastest 400m hurdles time by more than one full second in 56.10 and Michael Norman sweep his 200m prelim and semi-final with ease. Both finals close out tomorrow night's action. Candace Hill twice broke the championship record in the 100m: first, in the semi-final with a 11.12 (+2.0) clocking, then again in the final with a mark of 11.07 (+0.9) for the gold medal. 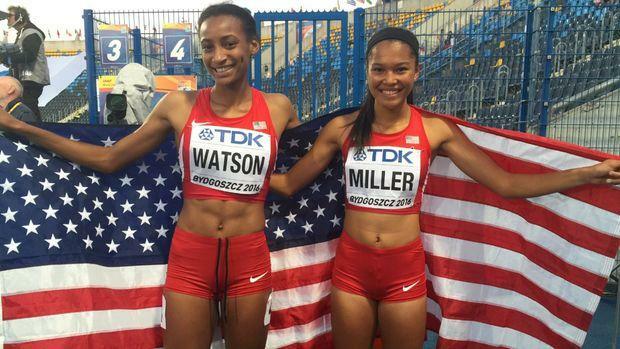 Sammy Watson and Aaliyah Miller became the first U.S. duo to sweep the junior women's 800m at this event. There was a formidable pack at the bell lap, but Watson charged forward for the win in 2:04.52 and Miller swung wide from lane two to take runner-up honors in 2:05.06, just ahead of Ethiopia's Tigist Ketema in 2:05.13. Marcus Krah and Amere Lattin immediately followed Watson and Miller's sweep with a 1-2 punch of their own to make the junior men's 110m hurdles an officially American event this year. Both set new PBs as the UNC Chapel Hill-bound Krah ran 13.25 (+0.2) for gold and University of Houston freshman Lattin ran 13.30 for silver, a feat made all the sweeter due to an injury hampering Lattin's previous international outing for Team USA. Candace Hill redeemed herself after what she called a disappointing showing at the U.S. Olympic Trials by winning the U20 100m dash title over Trinidad & Tobago Olympian Khalifa St. Fort, a fellow high schooler-turned-professional, and Ewa Swoboda, the Polish hometown hero and World U20 record holder in the 60m. 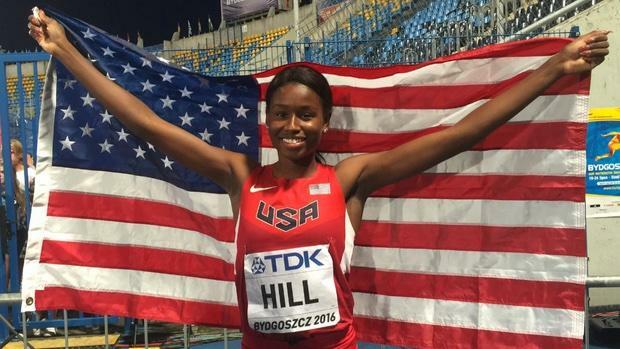 Hill, who represents ASICS, twice broke the championship record: first, in the semi-final with an 11.12 (+2.0) clocking, then in the final with a mark of 11.07 (+0.9). Swoboda held on to second in 11.12, a new Polish national junior record. The Zawisza Stadium went crazy for the Polish star and she popped a bottle of champagne in the mixed zone. St. Fort took third in 11.18, nearly equalling her PB of 11.16. She will race the 200m and 4x100m relay in Bydgoszcz before turning her attention to Rio. "I feel like I was down after not making it to the finals in either event [at the Olympic Trials]. I felt like I was ready, however, I didn't perform well... It means so much more [than winning World Youth last year] because like I said, I didn't get the results I wanted from the Trials. so coming here and ending my season out strong and with a new seasonal best feels amazing."